School is back, swimming and cricket start next week, and forms and dates to remember are flooding in from all directions. Sound familiar? This could easily get overwhelming and out of control, if it were not for my trusty Home Command Centre - aka drop zone; launch pad; flight deck... there are many different things to call it - basically, the one central point in my home where I can manage my family's schedules, activities, and "stuff". These control centres can come in many different sizes and formats, and today I am going to show you how to create one that is just right for your needs in 3 easy steps. Rather than choosing a layout that you like and trying to find somewhere to put it, choose the location first and design the layout to fit accordingly. Setting it up in the right location is essential for its success. 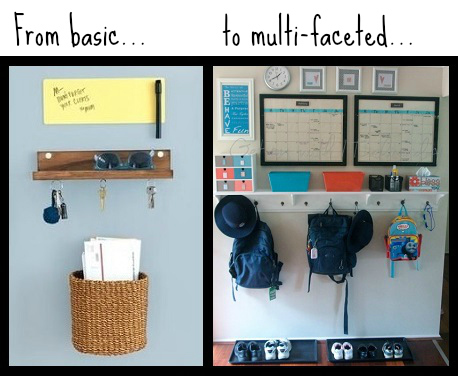 Where do things like your keys, mail, and kids' school bags naturally accumulate in your home? It could be the kitchen bench, the dining table, or near the front door - but that is the best location to use. Change is not often embraced easily, and introducing a new system for your family is change enough. By using the natural flow and existing habits of your family, you are much more likely to make this work. 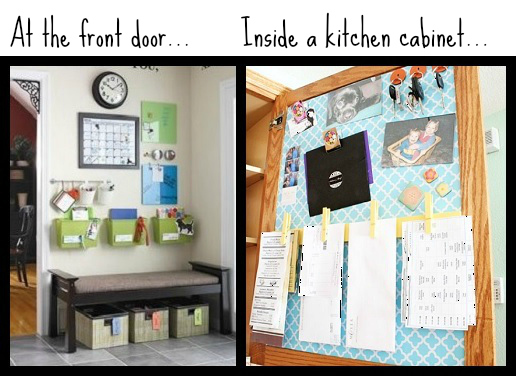 Are you a "shoes off at the door" family, or would you like your command centre to include a basket or shelf for shoes? What kind of sporting equipment and kit bags need to fit in there, or are these left in the garage? How many family members do you have? Your command centre can consist of a single notice board, or an entire wall full of hooks, hangers, shelves, containers and calendars - it all depends on your unique situation and requirements. Write a list of functions you would like your command centre to serve, and then you will be able to determine which organisational tools you'll need to meet those needs. Set up your command centre in your chosen location from step 1, with the required tools from step 2, and keep the family involved with its design. Depending on which self-help book you read, it is generally believed to take between 21 and 30 days to change a habit - IF you consistently practice it every day. Give your family some time to trial the new system and see how they feel about it. Ask for their feedback and make adjustments accordingly. The more input they have, the more likely they'll be to accept the new system. Don't throw in the towel if it doesn't seem to be working after a few days - allow everyone a few weeks to change their habits until it becomes instinctive, and soon you'll find school notices magically appearing on the notice board and library books being returned on time - without the usual morning panic. Yays! If you would like some inspiration for creating your ideal command centre, check out my Pinterest board - it is packed with different layout and functional design ideas. Do you use a home command centre? What have you found to work or not work for you? I would love to hear your feedback!